Whether your Man swings a big hammer, can build anything from duck tape, or has a running account at the hardware store, he will love wearing his Tool Man Personalized T-shirts. An unique Personalized Gift that touches the soul of your handy man. Your Handy Man Personalized Shirt is Available on our premium white 100% cotton Personalized T-Shirt, machine washable in adult sizes S-3XL. Also available in Ash Gray. Includes FREE Personalization! 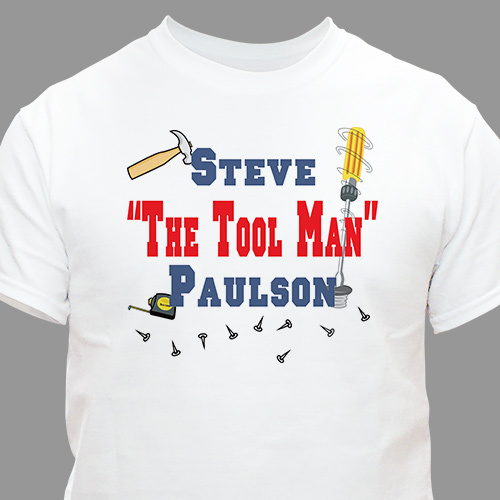 Personalize your The Tool Man T-Shirt with any first & last name. This is a great quality shirt with the cutest sayings - he loved it. He wore it for his B-Day - tools have always been his toys.